It’s all about the table. If I find the table, the food will come. My hunt is specific and single minded. 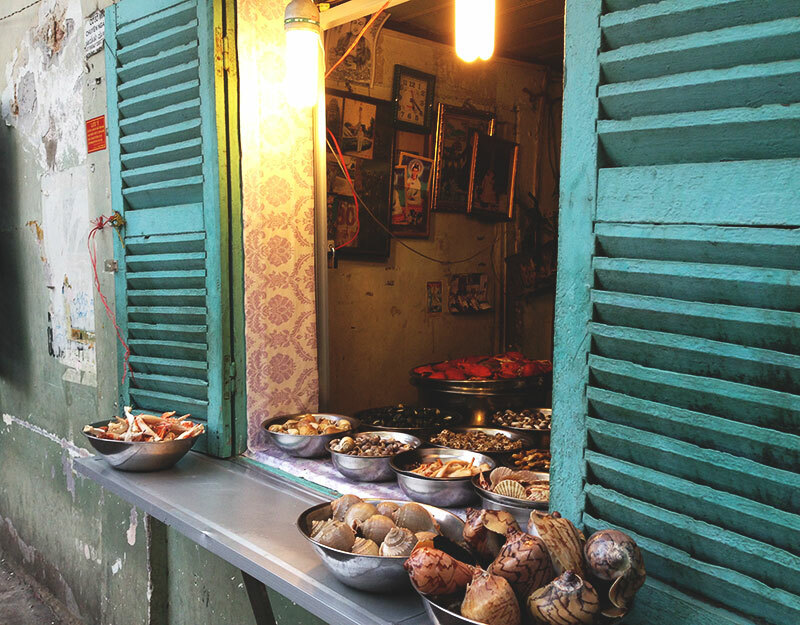 Down alley ways that are loud with activity, past doorways in which women crouch low to the ground to peel vegetables, between street stalls that smell of salt and fire, clouds of steam released into the air every time a lid is lifted from a huge metal pot; I search. It’s past breakfast time, and I am hungry. 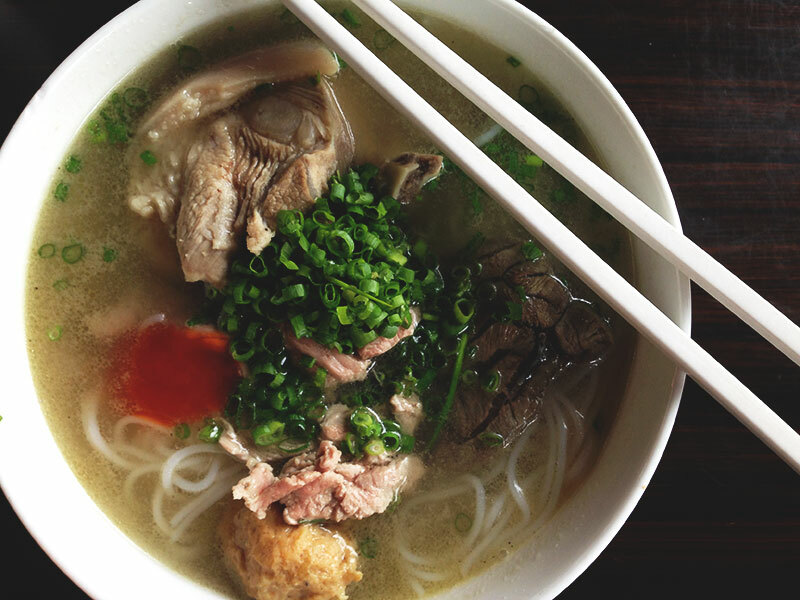 I’m searching for pho, Vietnam’s national dish; the soup of a nation, a revolution in broth and noodles. It is the definition of street food, the people’s food. Recipes are guarded closely, each broth a secret whispered through decades, passed between family members with love and trust. It varies from one end of the country to the other; Hanoian pho bac is a clear, clean tasting broth, with less spices. The Southern pho nam is sweeter and embellished with the exuberant herbs and vegetables that prosper in that part of the country. Everywhere the noodles are perfect, pristine white rice noodles with a tender bite, and everywhere it is delicious. 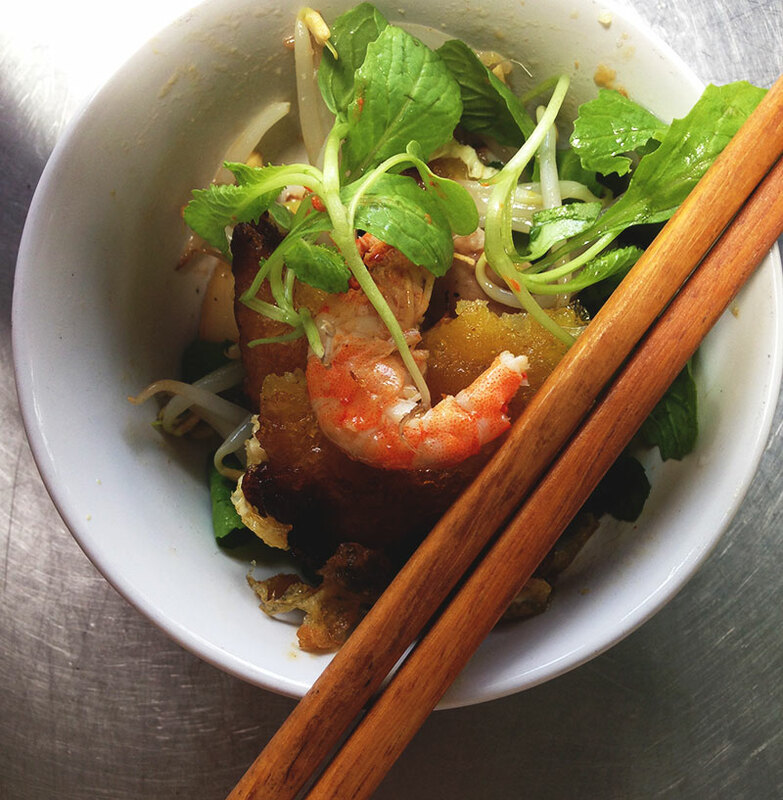 In Saigon, pho is the way the city does breakfast. It is a broth so unguent, so deliciously savoury, both delicate and swarthy, that it needs nothing but a squeeze of lime and a salty splash of fish sauce. It is smoke and salt, heat and sour, simmered from marrow and laced with ginger. The beef is soft and bloody, it tastes like the earth. Rounding a corner, dodging a group of running, barefooted children, I see it. The table, the only one with an empty seat in a sea of slurping xe om drivers, nestled in the corner in the shade of a tattered green awning. It’s perfect, aluminium topped, with a child sized stool in rainbow bright plastic. A basket of jars and bottles sit in its centre, plastic and label-less, the kind of bottles that hold secret ingredients and generations of kitchen stories. There is a china pot full of dried chilis, a pile of beansprouts, a bundle of leafy herbs, bitter and picked-at-sunrise fresh. I sit, and almost immediately a bowl is placed in front of me. I dip my face to it, and am enveloped in a sweetly pungent cloud of aromatic steam. It is a broth so unguent, so deliciously savoury, both delicate and swarthy, that it needs nothing but a squeeze of lime and a salty splash of fish sauce. It is smoke and salt, heat and sour, simmered from marrow and laced with ginger. The beef is soft and bloody, it tastes like the earth. Each spoonful of broth holds a hundred notes of flavour, a concert hall of a soup. It is a wonder. I finish my noodles slowly, savouring the morning light and watching people and bikes rush past me in a colourful gaussian blur, a small moment of perfect peace and content at the heart of the Saigon storm. I lift the bowl to my face and slurp, just like the xe om drivers do it. It is a gloomy, storm filled day in Hue, all humid grey and purple haze. The Perfume River is not living up to its name; a sweet and sour bloom of rotting garbage lingers in the wet streets that surround it. We are on our way to the forbidden city, Miles and I, but first things first – I want pancakes. There have been many pancakes in my life. I have eaten banana pancakes in Thailand, sticky with honey, and American breakfast pancakes topped with a salty crunch of bacon. There have been galettes in France, filled with soft ham and cheese and a perfect fried egg, and Scotch pancakes with butter and jam and strong tea. There was the solace of pancakes with lemon juice and sugar, that one pancake Tuesday when I burned my too-little hand trying to flip my own in the heavy pan; sweet and bitter through a mouthful of tears. Banh khoai are different. 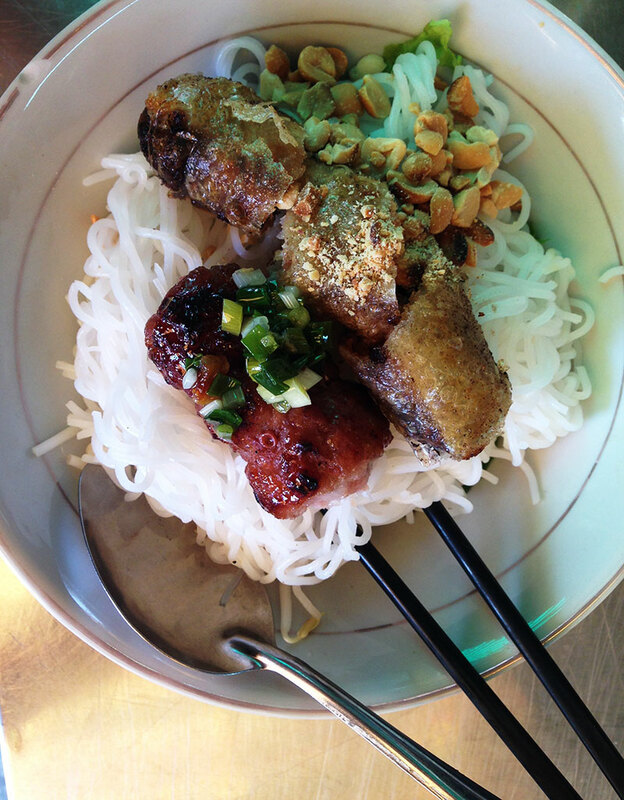 They are savoury and delicate as lace; shrimp, pork and beansprouts nestling in the batter like pearls. The batter is made with sugar and carbonated water, which gives them an airy crunch, and turmeric which dyes them bright sunshine yellow. Mine are served with a small mound of herbs, which I pile on top before drenching everything in sticky hoisin sauce. Then I order another one. I am a little lost in Hue, a little fatigued. Vietnam is my place, and yet I’m struggling to fit in. It has changed in the years I have been away, and I feel a pang of anger every time I see another backpacker bar crawl or trebles night. The feeling intensifies here, in this city of ghosts; steeped in sadness and beautiful with the remnants of a great and ancient dynastic history. I hit a low point when a backpacker I just met tells me he’s ‘not all that bothered’ about seeing the citadel and knows exactly nothing about the history of this place, but can recite from memory the shots list from the nearby backpacker bar. I spend a lot of time wandering the streets looking for food, for some physical sustenance to compensate for whatever it is I am lacking. Today it is the bun bo stall in the centre of Dong Ba market, where I drown my frustration in a heaping bowl of soup, the fragrant lemongrass broth enriched with a metallic heat from the cube of congealed pigs blood that dissipates amongst the noodles. The market is vast, a dark hall of dancing shadows and musk, everything you can imagine piled around the walls and spilling onto the floor. The soup is hot and I burn my tongue. 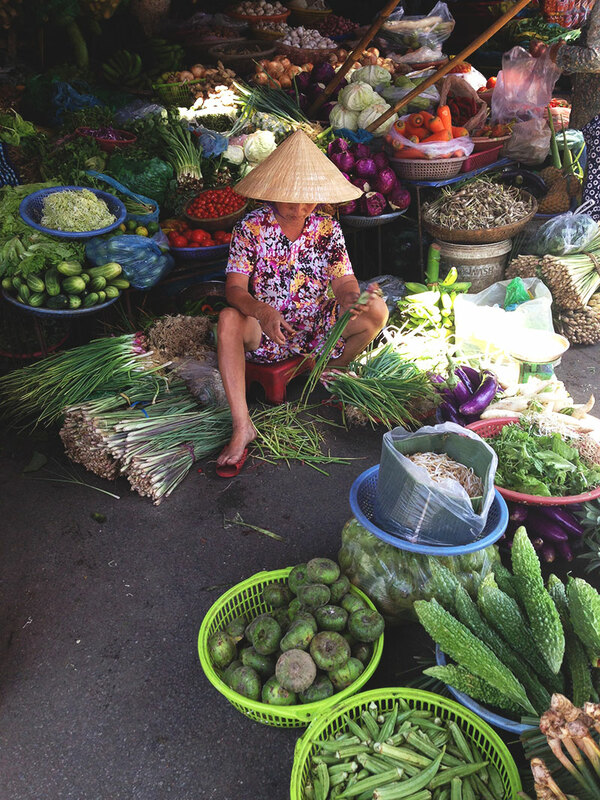 An old woman shouts at me for taking a photo of her vegetable stall. It’s time to leave. It’s 6am, and I am reluctantly but inescapably awake. The air in the dorm is close, sweaty, filled with sighing sleep, but when I close the door gently and head outside I find myself thrown into a world in which morning started with the sun, full of rushing traffic and horns and bustling people. The air is warm already and feels faintly damp on the skin of my forearms. I walk to the corner and take a seat at the worn wooden bench in front of the stall on the edge of the morning wet market, smiling at the fierce elderly woman who wields her ladle like a weapon. She laughs at my attempts to order breakfast in Vietnamese, as she always does, and then gives me what I wanted anyway – a small patterned bowl of bun thit nuong accompanied by a tiny dish of sauce. 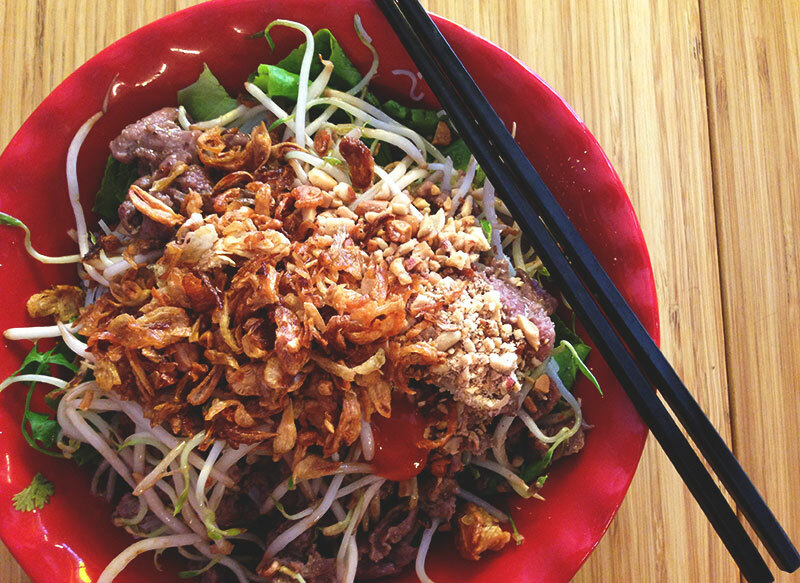 The bowl is filled with rice vermicelli and lettuce, a crunch of peanuts and green onions, some soft, sticky pork and a perfectly golden spring roll. I tip the dish of soy sauce and chilli over the noodles and use my chopsticks to stir. It is fresh and crisp and salty, the pork intensely sweet, the whole bowl given a gentle kick of heat from the chilli and onions. It is one of my favourite bowls of food in the world. 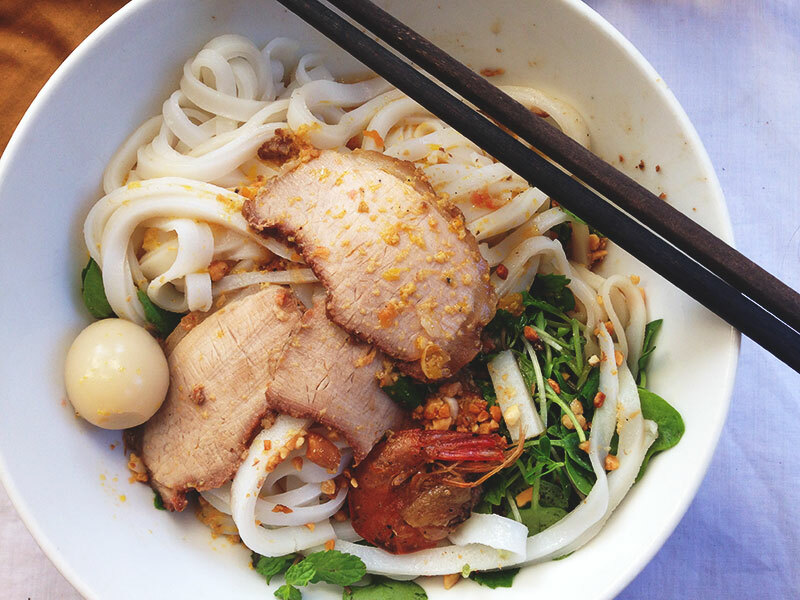 Pho may be the food that the world sees as synonymous with Vietnam, but there are so many other dishes that deserve recognition. Salads that sing with starfruit and fiery ginger, soups that are subtle or spicy or sweet, untold varieties of noodles. Fat prawns wrapped in herbs and pickles and rolled in rice paper. The clams that we used to grill over oil drum barbecues on the street, washed down with bia hoi. And a perfectly balanced breakfast that involves spring rolls. 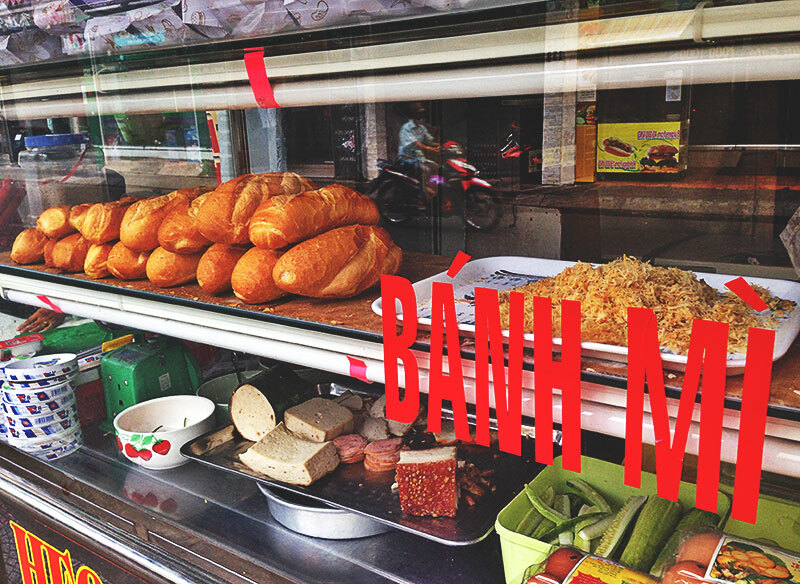 Banh mi is something that lives very close to my heart. It is, in my opinion, the perfect Vietnamese street food – the Gallic decadence of baguette and pork liver pate, topped with a briny punch of pickled daikon and carrot and the clean heat of chilis and Vietnamese coriander. It is a stave with which to hold off hunger on twenty hour bus journeys. It is the weapon with which I have faced many a hangover, a bludgeon of a baguette, eaten at 2am with an additional fried egg to soak up the rice wine. Tonight I venture out alone, wandering the streets of Pham Ngu Lao, low tables of laughing travellers washed in neon lighting and sticky heat. There is a stand on the corner with particularly good Vietnamese cold cuts, and despite already having eaten dinner I am answering my late night craving for banh mi dac biet. I watch, fascinated even though I have seen it done a hundred times, as the woman behind the cart slices a fresh baguette with a golden crunch, spreads it thickly with pate and mayonnaise, and piles it with belly pork, sausage that had Colored Casings, headcheese and pickles. She sprinkles it with fresh coriander and splashes it with soy sauce before handing it to me wrapped in greaseproof paper tied with string. I meander happily back to the dorm, which that night I have to myself, clutching my prize. The crust of the baguette crunches as I bite into it, the inside chewy and cloud-like. The taste is bright, green and white, soft and rich and sweet. I eat rapturously, completely content. 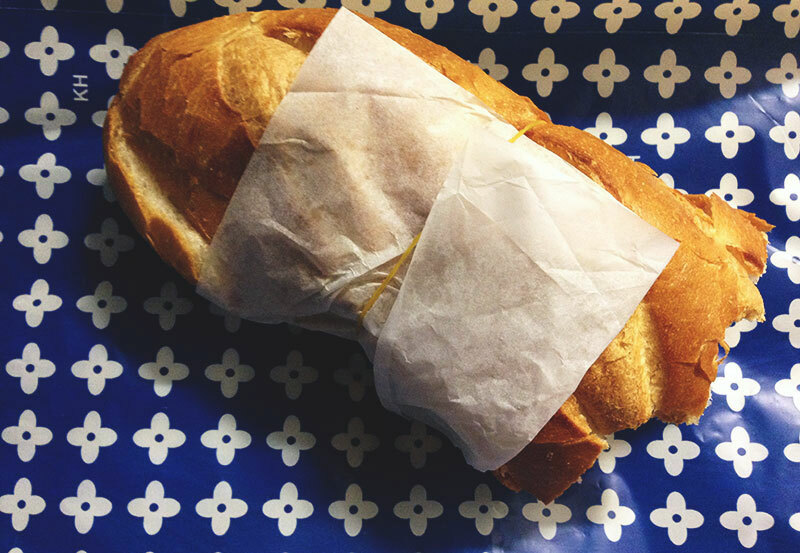 As I reach the middle of the sandwich, my teeth crunch through something crisp and juicy. Immediately a spreading heat begins to burn at my tongue, a tingling numbness on my lips. The pain swells in my mouth, growing fiercer by the minute. Tears spike in my eyelashes as I peel back the lid of the baguette, and peer inside to see a good handful of raw birdseye chillies sprinkled liberally over the pickles. Fanning my face uselessly with my hands, I gulp at a bottle of water, hot tears running freely down my cheeks and sweat beading on my forehead. My tongue feels too big for my mouth. I look in the mirror and see that my lips have swelled to Kardashian-esque bee stings. I return to sit on the bed, looking mournfully at my half-eaten banh mi. My fingers tremble slightly as I pick the chillies out, placing them delicately to the side, before replacing the top and continuing to eat. It’s too delicious not to. Like a child that eats four slices of birthday cake even though they know it will make them sick, it is the curse of the truly greedy to never learn their lesson. How good are VIetnamese spring rolls?! 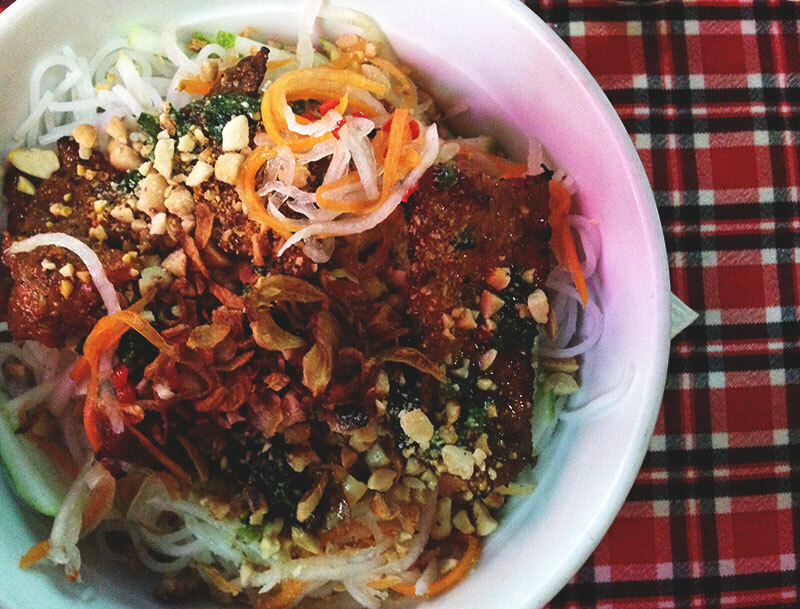 The food was one of my favourite things about Vietnam, it blew me away and this brings back some wonderful memories! It’s definitely my favourite foodie country that I’ve travelled to so far! Aye, ouchie! 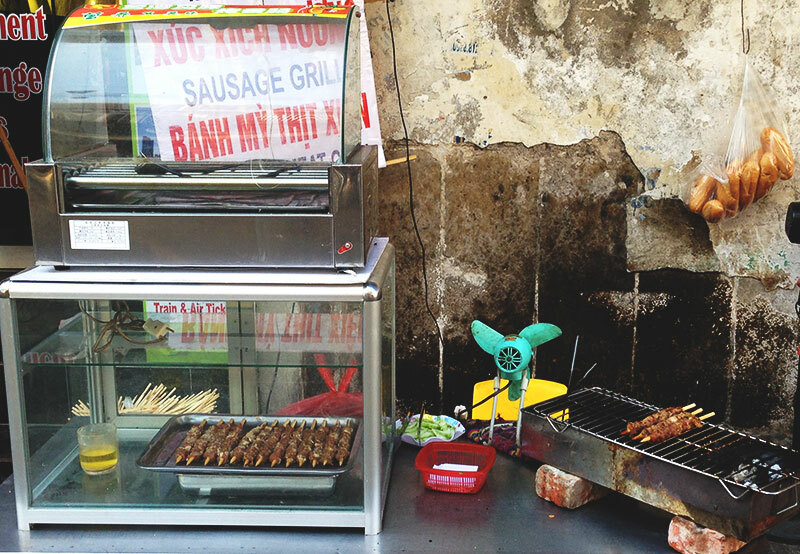 Glad you still had enough tastebuds to enjoy the rest of your banh mi. 🙂 Everything in this post looks so very delish. Thank you for transferring me back to Vietnam for those five minutes that I was reading your blogpost. Your writing is truly wonderful, I could almost smell the Pho! I spent six weeks in Vietnam last year in the summer. It is foodheaven there, I think i didn’t even try 20% of different kinds of food in those six weeks. You’re very welcome Karlijn! Vietnam definitely is food heaven, I think it’s my favourite country for food of all the ones I’ve visited. I just went to Vietnam (okay, technically you could say it was last year, since today is Jan 1) and I loved it! I loved the food even more; and you’re absolutely right! Pho is delicious! And even though pho is like the famous trademark of Vietnamese cuisine, I also had the most tasty hu tieu (rice noodles) and mi (vermicelli) in Ho Chi Minh too. 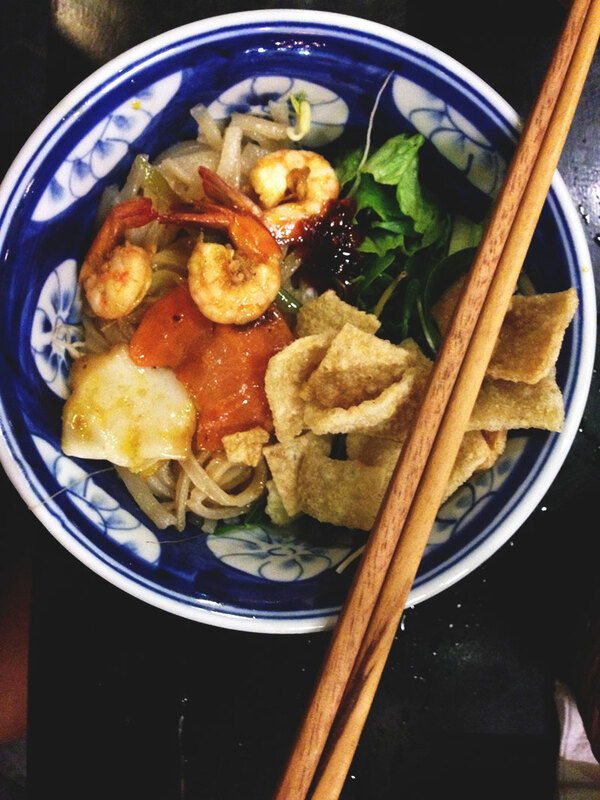 Vietnam seriously has oodles of scrumptious noodles, haha!